This story tears my heart out, and so I have to share. There isn’t anything that can be done through our donations for this little boy, but your prayers can make a difference! "Please feel free to share the following on your blogs. It is a summary of our adoption journey so far. Please help us spread the word. We are hoping somehow someone will be able to help us. We are hoping that someone will hear our outcry and help us bring our son and these other waiting children home. His adoption will set the precedent for many other children in his region. 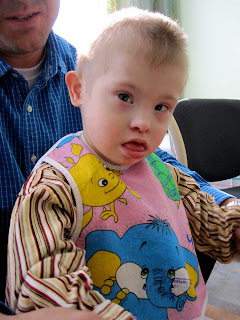 There are 98 children in his orphanage with special needs alone. It is one of many orphanages in this region that houses children with special needs. This is about more than just one child, the lives of hundreds of children with special need are at stake. Please help us." Please pray and if you feel compelled to help financially, there are a host of children listed on Reece’s Rainbow who could use your help to make it to their forever homes!